There were two kinds of professionals, the gamblers who stayed in one town for months or years, and itinerant gamblers who traveled so they could play opponents they might never see again. Guess which type cheated more often. Resident gamblers made their home in a town or city. They often worked in boomtowns, where a gold or silver strike or the coming of the railroad had caused a “boom” in population. Resident gamblers, like all good Victorian-era Americans, guarded their reputations. These men were seen as upright members of the community, men with a skilled profession, even though they may have worked in raucous saloons and gambling halls. They were called “square dealers.” Square meant fair, honest, and straightforward. We still say “square deal.” Some resident gamblers were women. They were skilled at the games, and they made a good living without cheating. Many of them probably cheated occasionally, for instance, they might if they realized an opponent was cheating them (The Gamblers, Time-Life Books). 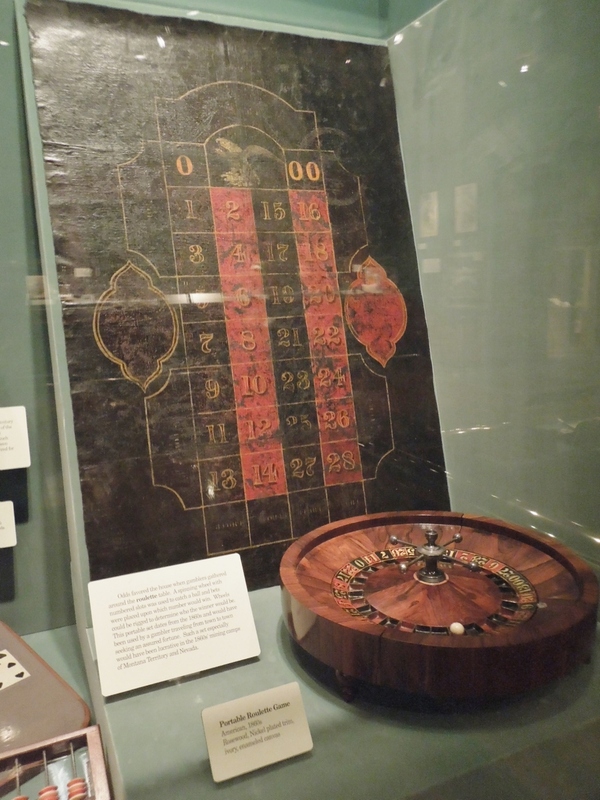 A portable roulette game from the 1860s. The roulette table above is heavy, with the layout, the area where people placed their chips, painted on the table. 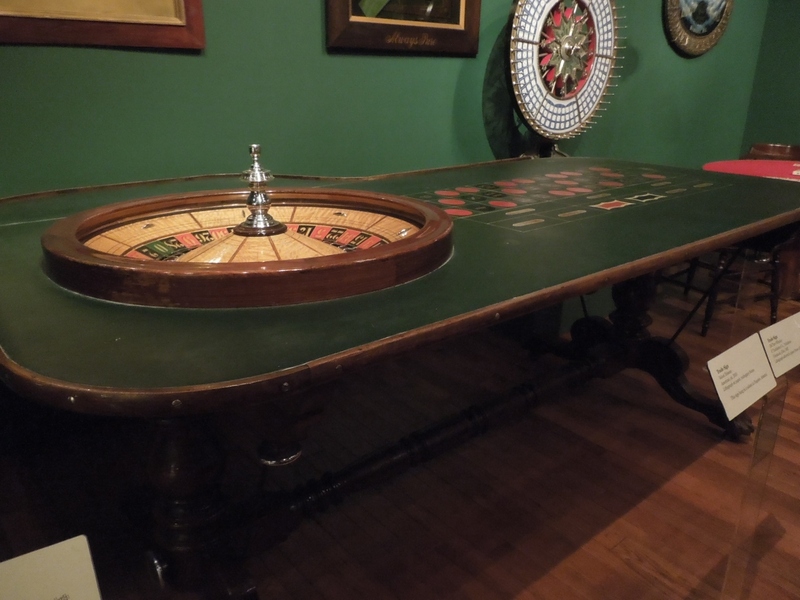 By contrast, the roulette setup at right has a separate wheel and the layout is enameled canvas, which the itinerant gambler could roll up for travel, great when he needed to make a quick getaway. Roulette wheels were sometimes rigged. Itinerant gamblers liked playing travelers on the great Mississippi riverboats, river towns and trains. Travel was slow compared to today, so travelers had time, they carried money, and many had come west looking for fortune and adventure. Camps of miners and prospectors were prime territory for itinerant gamblers. Prospectors hoped to get lucky and strike it rich by finding silver or gold, or at a game of chance. The cheating, fly-by-night gambler was happy to play them. I love your writing and how you bring small, important objects to our attention and open the world with their history. The photos of the roulette wheels are fascinating. Isn’t it curious that everyone knows the sound of an ivory marble in a roulette wheel? Thanks, Penny. I took other photos about the gamblers the same day, and only later saw what they told. More stories later. If I ever need to describe a gambler in my stories, here is very useful information to build some sympathetic characteristics into a person who would normally be considered a negative personality. Fascinating read. I wouldn’t have known about this distinction without this post. How interesting! I did not know, either. I was required to do a little research for my Toastmasters speech, and am I glad I picked gamblers. I’ve got more stories about them.